New research from the Department of Communication and Michigan AgBio Research at Michigan State University shows that people from the United States and China respond differently to mass media and social media campaigns related to food waste. While people from both countries share similar attitudes about food waste prevention, social norms and cultural orientations influence the type of communication that works best for getting the message across about health and environmental issues. Rain Wuyu Liu began studying how social norms impact communication designed to change behavior as part of her doctoral program in communication in MSU's College of Communication Arts and Sciences. She chose to examine food waste prevention after observing the huge amount of food that got wasted every day in university dining halls, and after hearing that nearly a third of all food produced worldwide gets lost or wasted. Her curiosity was also piqued when she learned that food waste generates a substantial amount of greenhouse gas that hurts the environment. "That was enough for me to get interested in this topic and use it within my communication research," she says. "I also saw that I was buying too much food and throwing it out." Liu started her research in 2014, culminating in her doctoral dissertation in the summer of 2017. Her study was among several projects within ComArtSci that looked at how social norms interact with culture to affect people's environmental behaviors and decisions, and was supported by the National Science Foundation. "In general, people in the U.S. tend to interpret things based on what has been communicated explicitly," she says. "They hear a direct message and are not likely to go beyond what they’ve heard. In China, messages can be less direct. People interpret the social sanction even if the message about a socially disapproved behavior doesn't mention it." 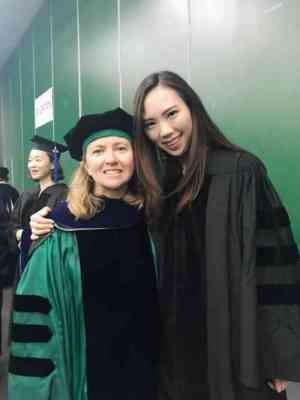 Professor of Communication Maria Lapinski served as Liu's advisor. She is also the principal investigator on a series of NSF-funded projects involving social norms, environmental behaviors and intercultural communication. She says Liu's study began with the basic premise that cultural and social norms influence a person's behavior. The key to Liu's study, she says, was to identify the most effective form of communication for influencing environmental behavior given the social norms of a specific country. "When there is a communication effort to shift people's behaviors in some way, the structure of communication is important," says Lapinski, also a professor in MSU Agbio Research and Director of the ComArtSci Health, Environment and Risk Communication Center. "Studies like Liu's help us understand how that structure should differ for different groups."